This teapot is an example of Yixing (also spelled YiXing) pottery, from the Yixing region in the Jiangsu province of China. 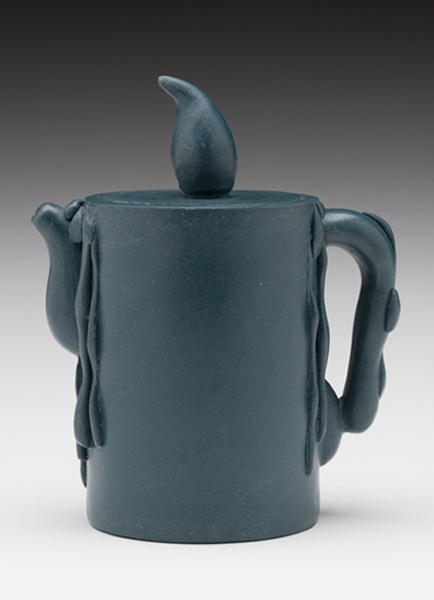 This particular teapot, made of dark teal, unglazed stoneware in the form of a melting candle, won a prize at the International Ceramics Competition in Mino, Japan. It is stamped with a maker’s mark on the underside of the teapot. Yixing has a long history of making ceramics, and its teapot industry dates back to sometime in the Sung Dynasty (960-1279). The region is known for its unique clay deposits, known as zisha clay, or red or purple clay, which is high in kaolin, quartz, mica, and iron oxide (around 66 percent). The kaolin in the clay makes it especially hard and durable when fired, while the mica gives in a sandy, rough texture and the iron oxide gives the clay its distinctive red-brown or purple color in its raw form. Yixing pots are not glazed, but instead get their colors from the natural color of the clay and pigments added to the clay before it is fired. This pot may be colored by mixing it with other clays or muds, such those with a higher aluminum or un-oxidized iron content, or with natural plant pigments. Yixing pots are usually hand-built by patting them into shape with hands and paddles. This gives them a denser clay body than if the clay were rolled or thrown on a potter’s wheel, making them especially durable. Because they are individually made, they are often artistically formed, with unusual shapes, naturalistic forms, incised or raised designs, colorful slip decoration, or sgraffito designs; the forms of Yixing pots are enormously diverse and inventive. Because they are not glazed, Yixing teapots remain porous after firing, allowing them to soak in the flavor and scent of the teas brewed in them, and many users will have separate teapots for different tea flavors. They are usually small, holding only one or two cups of tea. They can be used for brewing and serving tea in cups, or for drinking tea individually by sipping from the spout. Ateatime. “All Yixing teapot Clay Type.” Steepster, 2012.
International Ceramics Festival MINO official website. The Stonewares of Yixing: From the Ming Period to the Present Day by Kuei-hsiang Lo, Hong Kong University Press, 1986.